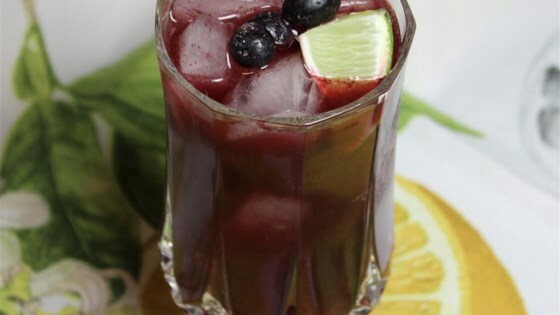 "Refreshing blueberry limeade is prepared with fresh blueberries, lime juice, and sugar. Serve cold over ice. Stir well before serving." Blend blueberries, sugar, lime juice, and 1 cup water together in a blender; pour into a pitcher. Add remaining water and stir. I am the submitter off this recipe and I now use Stevia in place of the sugar. Just as tasty and refreshing with less calories. Hope you enjoy! Pretty flat, watery...little blueberry flavor. Simple, easy recipe with a nice flavor. Definitely make this again. My son wanted to make this so I supervised him in the kitchen while he put this together. He says he would make this over and over again! This stuff is addictive! I used agave syrup instead of sugar reducing the amount as well. Thank you for the recipe! I liked it. I made half the amount and used twice the lime juice. I froze some in an ice cube tray for later. I found the blueberry limeade to be quite watered down. I ended up adding about 50% more blueberries and lime juice and it was still watery.